I get asked about my writing process and where I write so I wanted to share my Top Ten MUST HAVE’s for writing sessions! My MacBook Air (& its charger)– It’s light and travels well! My iPhone – The notes app is my friend! Snacks – Sometimes it’s chocolate, or granola and dried fruit, or a protein bar, just something so I don’t get hunger headaches. So there is my complete (and very unglamorous) list of writing session must haves! Van isn’t at Second Chance for publicity or because he’s suffering from “exhaustion”. He’s on the brink of destruction, and he needs the kind of help Stella isn’t sure she can give. But without her, he'll lose everything. Because he’s on his last second chance. Source: Info in the About Last Second Chance was from the press kit from the publicity team. Caisey Quinn lives in Birmingham, Alabama with her husband, daughter, and other assorted animals. She is the bestselling author of the Kylie Ryans series as well as several New Adult and Contemporary Romance novels featuring southern girls finding love in unexpected places. 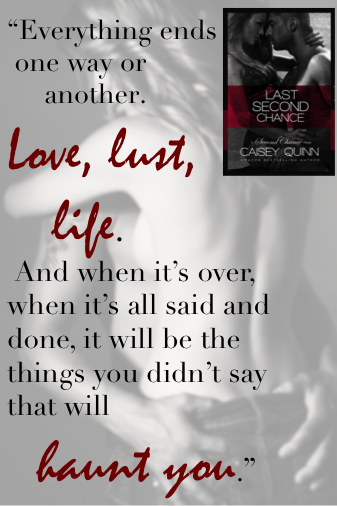 You can find her online at www.caiseyquinnwrites.com.